Indian Summer is an InfoBarrel author with an interest in personal finance and travel. If you are interested in writing online in a great community InfoBarrel is the place for you. You can find out more about this community by following this link. Learning how to pan for gold can be fun and turn into a lucrative hobby, but before you get bit by the gold bug, realize that just like in the gold rushes of yesteryear, prospectors today have little chance of striking it rich. However, if you do decide to pursue the lure of the yellow metal, you will be sure to cash in on some great memories, quality time in the outdoors, and, with a bit of skill and a lot of luck, you might just find a bonanza. The gold pan is the most important prospector’s tool. Don’t skimp here. There are many different styles, colors, and component materials and you can experiment with what works best for you. I prefer to use a plastic forest green pan with riffles that cover at least ¼ of the side of the pan. Grab a shovel that will be comfortable to use. Lighter is better if you’ll be walking long distances to your prospecting site, but make sure that it is sturdy enough to pry small rocks out of stream beds and will hold up to heavy use. The classifier is an important piece of equipment that will make your panning easier and more efficient. You can pan without classifying first, but material is easier to process if it is all of uniform size. The most common classifiers will fit in your pan or over the top of a five gallon bucket. A snuffer bottle or tweezers will allow you to recover the gold that you’ve found with greater ease and a small glass vial will let your store your fine gold (it’s not all nuggets!). You can use plastic baggies, film canisters, or aluminum foil, but none of these options will secure your fine gold as well and I personally like the glass vials because they’ll magnify your finds once you add a little water from the stream. If you're interested in learning more about prospecting equipment I suggest you read the article "Tools You Need to Start Gold Prospecting"
There’s and old-timer’s saying that states “Gold is where you find it.” This means that you just might find the mother-load in a place that doesn’t make sense geologically at all. I’ve heard stories of “urban prospectors” who pan dirt from the gutters of jewelry districts in large cities and of laundry owners in gold rush towns panning the dirt from the bottom of their washtubs. However, you’re most likely to find the yellow stuff where it’s been found before. This means doing a bit of research. Check out areas that were mined in the past. Find creeks and rivers that run through gold bearing deposits and follow them downstream or upstream. Some important points to remember when choosing a location include safety concerns. Stay out of old mines and be sure to watch for pits concealed by underbrush. These can be dangerous and should never be entered (they’ve probably been worked out anyways). If you are travelling into the back country, be sure to bring a partner and let someone know where you’re going and when you intend to return. Also be sure to make sure that the area you’ve chosen to prospect has not been claimed by another person. Claim jumping is illegal and carries stiff penalties including jail time and fines. It’s also rude. Claims can only be made on public property (US Forest Service, or BLM lands) and you can check with your local agencies to find out if the area you wish to prospect has been claimed. Many times these agencies will also be able to give you tips on locations that you might have some luck in. If you want to prospect on private property be sure to get permission from the landowner. Most are glad to let you go, as long as you respect their property by filling in holes, packing out garbage, and showing them what you’ve found. Most forms of hobby gold prospecting involve placer deposits. These are deposits that contain gold visible to the naked eye as opposed to hard rock deposits that contain microscopic pieces of gold and which are usually mined by large corporations with significant amounts of capital. The great thing about placer mining is that nature has done 95% of the work for you by concentrating most of gold in any given area into a few key locations. The first thing that you must consider is gold’s density. Gold is 19 times heavier than water. It’s heavier than copper, iron, and even lead. In fact, there are very few elements that commonly occur in nature that are denser. Now, because gold is so dense it requires a large amount of energy to get it moving. Fast moving water can carry gold, rocks, dirt, mud, etc., (think spring floods from snowmelt), but if the water slows down it will start to drop the materials it’s carrying, starting with the heavier items first. Thus, the places where water slows down tend to be the places that accumulate gold. Gold can collect behind or underneath large boulders and rocks. The bends of creeks and the heads and tails of gravel bars are also good locations. My personal favorite is a crack in bedrock. Also, if you can find a nice pot-hole in the bedrock, the reward can be huge, especially if you’re the first person to get to it. So you’ve found the right area, and you’ve located a probable location for gold to collect. Now comes the fun part. Using your spade, pry out any large rocks and shovel your streambed gravels and sand into your screen/classifier. Shake your screen vigorously over your pan to separate the larger rocks from the finer materials. You should be left with materials less than ½ an inch in diameter filling approximately 2/3 of your gold pan. Next, take your pan to the water’s edge and fill it with water. Mix the gravels and water by shaking your pan and stirring the sludgy mixture with your hand. Now, if we remember that gold is much heavier than anything else in the creek the next step will make plenty of sense. Shake your pan vigorously to liquefy the sand and gravels. You want this material to be in suspension with the water in your pan. Once your material reaches this state, the heavier materials will sink to the bottom of the pan and the lighter will rise to the top. After several good shakings, tip your pan into the creek and pull the top bit of material out using the water in the stream. If your pan has riffles, be sure to pull the material over them as you work it. You should now have less sand/gravel in your pan than you started with. Repeat this process until you have 2-4 tablespoons of material left in your pan. If you’ve done it right, you should be left with a small amount of black sand in the bottom crease of your gold pan. This black sand is mostly iron, hematite, and magnetite. Being heavier than most sand, which is composed of silicon dioxide, it will have made its way to the bottom of your pan. You may also see small pink or red stones mixed in with this sand. These are garnets, but don’t concern yourself with them. Unless they’re very large and flawless, garnets hold little value as gems. Very rarely, gold prospectors will find diamonds in the black sands, so do keep an eye out for them! Now, shake your pan one last time to let the heaviest of the heavy materials work their way to the very bottom. Now tilt your pan towards yourself and gently wash a small amount of water over the black sands, slowly pulling them to the bottom of your pan. If you’ve done your job right, and if you’re having a lucky day, you’ll start seeing specks of gold. If you’re really lucky, you’ll see a nugget start to emerge from the sands. Using your tweezers for any larger pieces of gold and your snuffer bottle for finer gold and “flour” gold, remove your finds from your pan. Congratulations on your find, now you can call yourself a gold prospector! Well, there are many paths you can follow from the point of finding your first gold. Some folks find that it’s too much work and not the hobby for them while others catch gold fever and continue heading to the creeks and mountains for the rest of their lives. If you decide to continue your prospecting, you may want to collect more advanced equipment such as sluices, dredges, blue bowls, or metal detectors. You may want to look into the requirements for filing a claim on your “strike”. How far you take the hobby is up to you, but even if you just make it out for one day and even if you strike out you’ll still take home memories of cool forests, murmuring creeks and the great outdoors. Here’s wishing you luck and a bit of color in every pan. 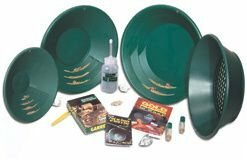 If you're new to gold prospecting and looking for equipment, Garrett sells this starter kit. It comes with everything you need to get started including reading material to help you find gold faster. Panning for gold is something I have always wanted to try. How exciting! This is an Interesting and informative read - great pick for featured article. Thumbs Up! I am a big fan of bearing sea gold and always wondered how to do this, thanks! Not sure there's any gold in my part of the world but fascinating nonetheless!